One issue only of William Cawthorne's Review: or town and country advertiser is known to have survived. Previously, in 1867, Cawthorne had begun the Illustrated Adelaide Post, a local version of the Illustrated Melbourne Post, to which he had been contributing illustrations of South Australian and New Zealand scenery and Aboriginal customs since 1863. The Review (apparently originally titled, Monthly) was issued once a month. 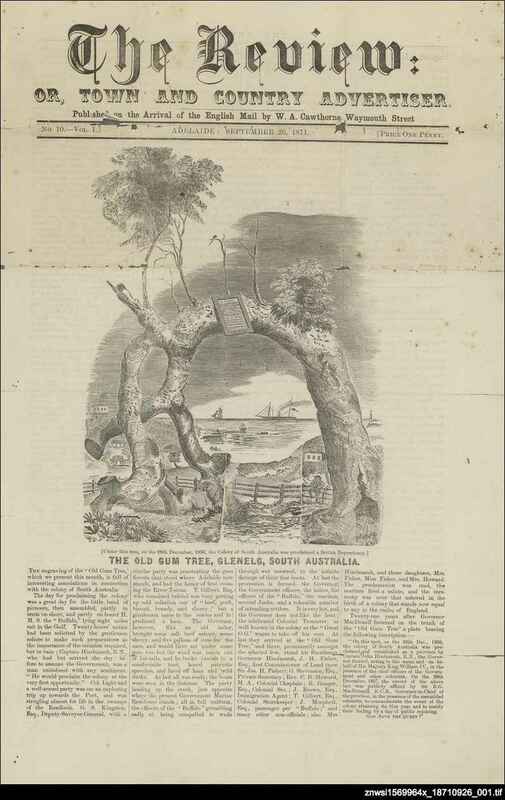 The cover illustration of this issue, a stylised depiction of the Old Gum Tree at Glenelg, had already been used by Cawthorne in his other publications. Cawthorne's main line of business was running a stationery and bookshop in Waymouth Street. His obituary claimed he was "the first to introduce illustrated newspapers for regular sale in the colony" (Adelaide Observer, 2 October 1897, p. 35). The Review was largely an advertising medium for his shop, and contained short reviews, as the title suggests, of English periodicals received and sold by Cawthorne - fourteen titles are listed in this issue. The editorial of the Review contains comments on recent religious happenings in Adelaide, in particular Bishop Shiel's denouncing of the Irish harp newspaper - which occurred during ongoing debate involving Mary MacKillop and her order of sisters.